The other night, we’d just got ourselves settled into the Zen Den to see what the O’s were up to when Hub spotted a bunny outside the door. I grabbed my art journal, threw myself onto the floor and did a belly crawl up to the French door to take a peek. Oh my gosh, so cute! I got about eight very quick, tiny sketches, because he moved about every five seconds, so for this post, I decided to sketch bunnies from random photos instead! I worked on this for a few days, and then last night when I was ready to finish it up, I found myself all bunnied out, so I decided to sketch a barn in ink to fill in the corner. Not perhaps the wisest decision to go right in with ink if perspective is an issue I want to thank Kathy at Backyard Bird Nerd for sharing her lovely photo (which you can find here), and which I once again haven’t done justice to. I really need to learn perspective though, and I’m not going to get there by drawing rabbits from photographs. I see more buildings in my future! Again, sorry for the bad art in the meanwhile! Is anyone else in the humidity soup and looking for a reprieve? Looking forward to some cooler, springlike air later this week. And maybe, just maybe, a mixed media experiment for tomorrow. We’ll see if the mixed media gods are sending grins or icy cold stares my way. Hey, the icy cold stares would work for me at this point. Happy Tuesday! Thanks for stopping by. Beautiful job on these! And I love the shed best. So there. Lol! Your drawing is amazing ~ it’s your forte! Love the shed and the bunnies. Thanks, C! Does this mean painting is out for me? I wonder. Full-body giant smile – with love. Those are great. I love the little building and tree. Thanks! Every time…..the artwork I almost didn’t post is the one everyone likes. 🙂 Not sure why that is. Do you have contrary readers? These are lovely! My favorite’s the bunny in the upper left corner. It’s a little tricky to demonstrate with text like this, but the above would be used to help scale objects that are closer vs. objects that are farther away. The angles you draw the lines at would depend on your perspective, I think, and the distance you’re trying to demonstrate. I think it helps to think of it as like 3D, with the point going into the page and the landscape that is closer expanding out toward you. This provides a sort of basic shape/structure of the landscape onto which you can map your object. I don’t know if that’s useful or just confusing, but if that trick sounds like something you wanna use, there it is! Oh dang, the text demonstration didn’t work ’cause it didn’t keep the spaces… Um, maybe I can do a demonstration for my exercise later today! I think I understood you. I’ve been reading about perspective (ok, it was weeks ago, but some of it stuck in my head). I really appreciate you taking the time to do that! Thank you! That definitely helps. I just need to practice it enough that it sticks in my brain. Thanks for taking the time to type all that out! I think the bunnies, and the little shed are lovely! I really struggle with perspective and getting all the angles right. I usually get them backwards! I recently read a tip about using an analog clock face to help draw the lines and angles by asking yourself, “Which number would that angle be pointing to if it were a clock hand in relation to the sides of the paper or canvas?” I’m going to be employing this tip especially with buildings! Thank you! I need to consider your tip. Is perspective the ultimate bugaboo? But it’s so satisfying when you get it (even close to being) right! Thanks, Alisa! I’m so glad you like the barn. 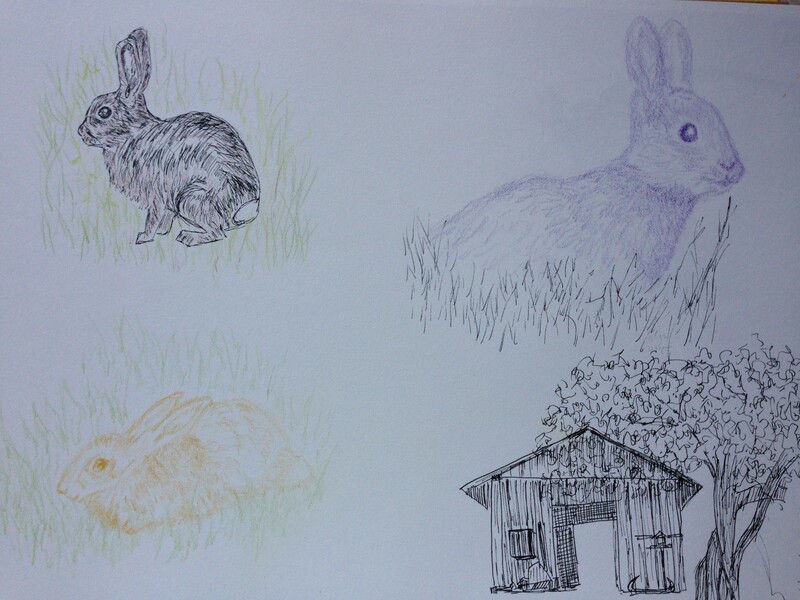 I would love to do more – barns and bunnies! Theres nothing “bunny” about your art!! haha, you captured the bunnies so cute!!! now you can remember that moment forever!! You’ve got those bright eyes down. I like the mixture of sketches on the page. Thanks! I’d like to sketch more buildings around the animals. A week slipped away too quickly, and I have to catch up on my favorite fellow artists. So, stopped by and did a quick breeze through, and hope to get a closer read of your thoughts later. For now, I really love your bunnies! You really created such a nice look of softness with the pen. How are you liking working with the the pens?